Let us invite you to our new concert, 'The Masters of the Acoustic Guitar'. We will introduce Mike Marshall (USA), who is not only one of the world´s best mandolinists but also a fantastic guitar player. You will see also David Doruzka (CZ), Paul O´Brien (CAN), Sammy Vomacka (D), Stano Palúch (SK), Martino Coppo (I), Michal Vavro (SK), Ondra Kozak (CZ), and others. 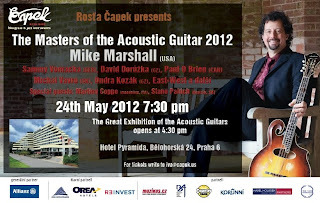 You will hear various styles of acoustic guitar music: jazz, blues, ragtime, Brazilian choro, folk or bluegrass.